Have you ever traveled internationally? If you have, I’m sure you’ve seen the reality of differing cultural values. You can often tell you’re rubbing up against a different cultural value when you have one of those head-tilting (or fist-clenching) “why on earth are they doing that?” moments. Some cultures see time as a specific value as shown on my watch, others as the appropriate timing as dictated by life events. Some cultures prize privacy, and some prize interconnectedness and hospitality. Some value planning ahead and saving for the future, others value enjoying life in the here-and-now. Which of these is correct? Well, it depends on who you talk to. Cultural differences can be the source of hilarious blunders and extreme frustration. They can also lead to profound miscommunication. Talk to anyone who has spent an extended amount of time living abroad, and they will have ample stories to illustrate. We expect some level of culture difference when we travel—it’s why we use terms like “culture shock”—because we recognize that we’re entering into a cross-cultural experience. We prepare ourselves. But when was the last time we consciously prepared ourselves for a cross-cultural experience when we picked up the Bible? Just that statement alone seems a bit strange, yes? It’s the beauty of holding the Scriptures in our own hands and the beauty of a God who reaches to us where we are, within our own cultural means—we forget how foreign the Bible is (speaking here as an American Christian). But we run the risk of forgetting that the Bible is not written from a Western, 21-st century perspective. This is not to say that we can’t understand it—simply to say that we would do well to remember that the Bible was written in a culture very unlike our own. Today, I want to share a resource with you that addresses this problem head-on. 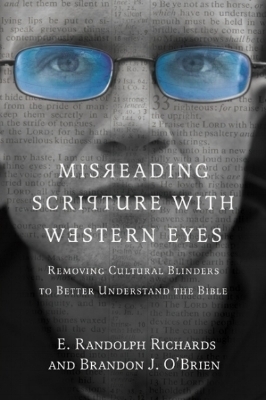 Anyone who has been in a Bible study long with me has surely heard me mention the book Misreading Scripture With Western Eyes. It is one of my current top go-to resources on the Bible; one of those books I always seem to find a way to recommend to people. The authors, Randy Richards and Brandon O’Brien, aim to point out our Western cultural blinders so that we can better understand the Bible. They explain different cultural values and norms, those things that “go without being said,” which shape our view of reality and the way things should operate. The good news is that you do not need to be a biblical scholar or a cultural anthropologist to make sense of Misreading Scripture. The book is peppered with clear biblical examples and lively stories of Randy and Brandon’s experiences in cross-cultural missions. It may just be me, but I found this book so engaging I didn’t want to put it down. And (added bonus!) there are reflection questions at the end of every chapter for your own pondering and application or to use with a small group. There are so many good snippets from this book I could probably do an entire series of posts on what I found to be helpful and interesting, but that could possibly lead to some copyright issues. And you really should have this book on your shelf. Why David’s cultural framework of honor/shame probably left him feeling justified with his behavior in the Bathsheba/Uriah debacle, not racked with guilt. It took intervention outside of his culture (Nathan the prophet delivering God’s message) to make him repent, and even then, his sense of remorse was specifically directed towards God (”against you and you only have I sinned”, Psalm 51). To think of public questions (like the Pharisees with Jesus) as an honor challenge (never about information). This explains more of why the Pharisees were so enraged when Jesus answered their questions well or stumped them with his own—they were trying to take honor from him but lost at their own game. Why Paul’s comments on modesty and dress for women were very likely about economic modesty (not flaunting their wealth and making the church into a social club), not about sexual modesty. And that barely begins to scratch the surface. The most overarching piece of advice from this book is this: Be on the lookout for something that could be a culture issue. Since “the most powerful cultural values are those that go without being said”, a good red flag is what feels to be a jump in logic. I find this a lot when I’m reading through Paul’s letters. I’m going right along, following his train of thought and then all of a sudden I’m sitting thinking, “How did he get there? How on earth does that relate to what he was talking about?” This can be a good sign to look around for a clue related to a differing cultural understanding. Look for repetition and the details that are included. Look carefully at what is actually being said, not at what you’re assuming is being said. The good news for us is that God, though He chooses to work within cultures, is above culture. Thinking more carefully about cultural differences between our culture and the Bible is incredibly valuable and can help us to better understand God’s Word. But His Word can be understood and be applied to any and every culture. Learning from our brothers and sisters in different cultures can help us all to get ever closer to what the Lord teaches us in the Bible. Instead of being frightened away by the differences or what we may have been missing for years, our desire to get past our cultural blinders and closer to God’s Word for us should encourage us to dig deeper in our study of the Scriptures, as we read with even greater care and hunger. If you want to hear more about this book, find a copy for yourself—or just join a Bible study with me. That’s a sure-fire method to hear more examples from it.